As I’ve mentioned before, I recently took a jam making class at the Brooklyn Kitchen Labs with Kelly Geary of Sweet Deliverance. I loved the class and now really feel like I can make jam. My second attempt went very well and I am really happy to share this recipe for a small, 4 cup batch of blueberry grapefruit jam. Grapefruit, especially ruby red, has such amazing flavor; it’s well-rounded, hitting tangy, bitter, and candy-sweet notes all at once. 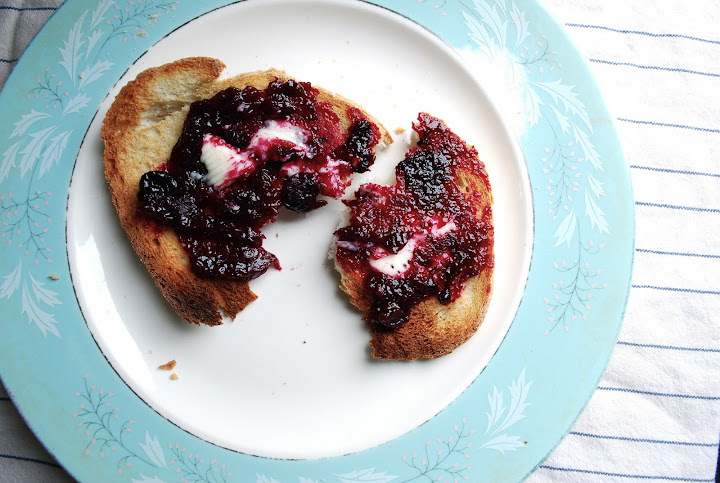 Combined with the blueberry, this jam has a rich, buttery flavor. Though we couldn’t wait more than a week to have some of the first jar, I am going to stash the other three in the back of the cabinet and savor the bright flavor on some snowy January morning. A note on jars and canning in general. I use Ball jars with rings and rims. When preserving you should always use new sealing rims. Your jars and rings can be reused as long as they are in excellent condition. To make sure, inspect them carefully for even tiny chips or cracks. Your jars should be absolutely, sparking clean. This recipe is meant for those familiar with the basics of canning. If you are a novice, please refer to the Ball canning site and follow their guidelines for safe canning practices. Place a two or three plates into the freezer. You will use these to cool the jam so that you can check the consistency. Wash 4-5 one cup, or 8-10 1/2 half cup, jam jars and lids in hot, soapy water, rinse, and dry. Set out two large cooking pots, one to sterilize the jars and one to cook the fruit. You should use a non-reactive, heavy-bottomed pot to cook the fruit–an enameled dutch oven is perfect. Fill one of the pots with water, add the jam jars, rings and lids, cover the pot and bring water to a boil (everything should be immersed). Once the water is boiling turn off the heat, return cover and let everything sit in the hot water while you prepare the fruit. 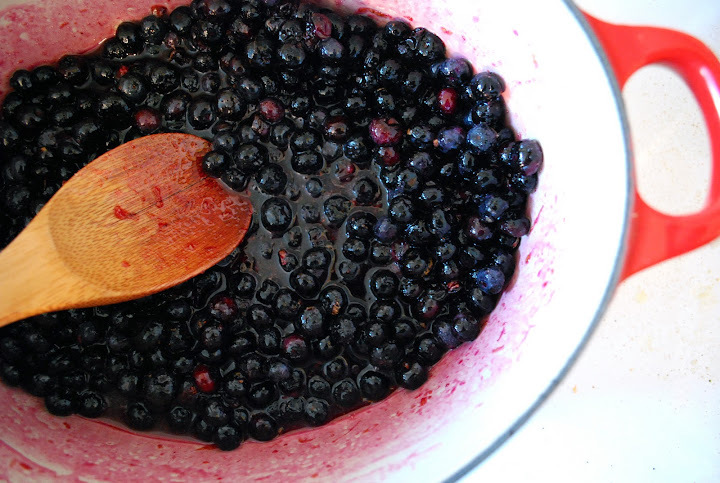 Add the blueberries to the other pot and cook over medium heat. Add one cup of the sugar, and the zests. Cook over medium heat for an hour, stirring occasionally. When the jam has reduced, add the grapefruit flesh, and then the juice. Continue to cook the jam down if things seems too runny. When you have achieved your desired consistency, prepare the pectin. Combine 1/4 cup sugar and the pectin powder in small bowl. Add the calcium water directly to the jam and then slowly stir in the powder and sugar mixture. Turn up the heat just until jam starts to gently bubble, and turn heat to low. When the jam has firmed up and reached your desired consistency, turn off the heat and test your jam. Place 1/2 teaspoon of jam on a cold plate from the freezer. Push the jam, if it wrinkles up and doesn’t run, it’s ready. If the jam is at all weepy or watery, cook the jam over low heat until it firms up, or add a little bit more pectin and calcium water. Keep checking as the jam cooks. 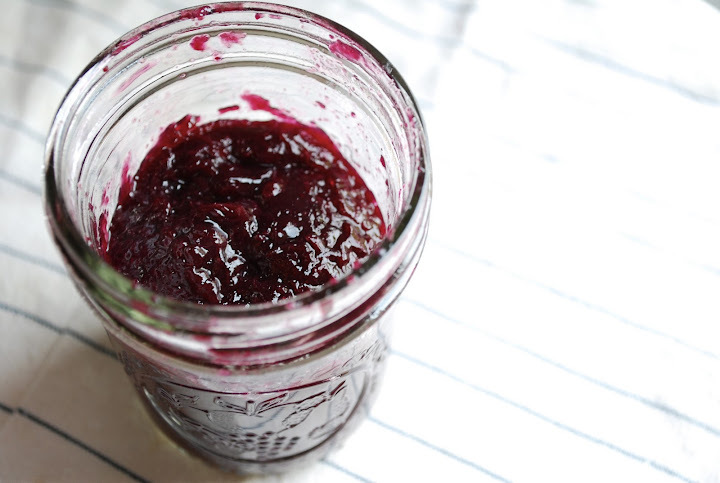 When your jam is ready, carefully ladle it into your jars leaving just 1/4” head space in the jar. Thoroughly wipe the jar rims, set the sealing lid into place, and screw on the rim. Fill your largest pot with water and bring to boil. Once the water is boiling, set two folded dishtowels on the bottom of the pot and add then the jars. Make sure there is at least 1” of water above the jars. Process for 10 minutes. Remove the jars from water, and set aside. If, for some reason, one of your jars doesn’t seal overnight, put it in the refrigerator and eat right away. The jam should keep for at least a year in your cabinet. Once opened, it will last for three weeks. So impressive! You’re jamming it up with confidence, and have a fancy new dedicated website! These things are on my agenda too, but have been sidetracked by little getaways. I’m in Idaho right now, and the place is crawling with blackberries – will be attempting my first jams tomorrow, with a ton of berries that I’ve picked, a makeshift kitchen, and some recently procured jars. Came back here to re-read your jam adventures. Kimberley! I’ve missed your blog, though I never mind staring longingly at salads with bacon. Glad I got around to posting this jam success in time. Blackberries sound divine. Let me know how it goes. Delicious, I love blueberry everything! Blueberry and grapefruit! I would’ve never thought of the combo, but it sounds so bright and wonderful. It WOULD be great on a cold January day. Thank you so much for this recipe! Naturally I added some things to make it my own, but I just wanted to say it’s wonderful!